'Delicious!' ... Isn't Legendary food writer Ruth Reichl stumbles on her first foray into fiction, with a novel about food, love and redemption that critic Heller McAlpin calls "as predictably sweet as packaged cakes." 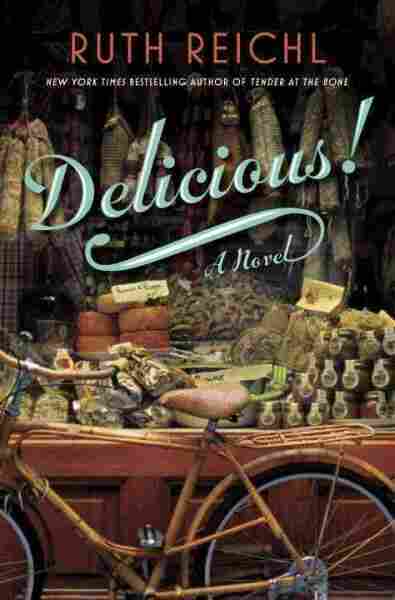 The exclamation point in its title is a clear tipoff: Delicious!, Ruth Reichl's first novel, is about as subtle as a Ring Ding. It's an enthusiastic but cloyingly sentimental story about a 21-year-old who finds happiness by making peace with her past — namely, her crippling, self-deprecating hero-worship of her older sister. After much angst, she comes to realize that "it was finally time to stop running from the best in me." As expected from the last editor of the late great Gourmet magazine and the author of such beloved foodie memoirs as Tender at the Bone and Garlic and Sapphires, cooking is central to Reichl's novel. Billie Breskin, her young narrator, is blessed with the culinary equivalent of perfect pitch — an acutely fine-tuned palate that can pick out notes of obscure spices like curry leaf from a complex sauce. Yet because of a traumatic experience (which we of course learn about in due time), she has dropped out of college and fled the thriving Cake Sisters baking business she and her sister started as kids in Santa Barbara, Calif. Just the thought of cooking causes Reichl's distressed heroine panic attacks. Hoping to write instead, Billie gets her dream job as an editorial assistant at Delicious! magazine in Manhattan, reflecting on her good fortune "to have landed in the one place on earth where recipes were taken this seriously." The dream job is housed in a dream location, a lovely Federal-style mansion built in the 1830s on a "tree-lined street" in Greenwich Village. But, as Robert Frost noted, nothing gold can stay. Just like that — and just like what happened to Reichl and her staff at Gourmet — the publisher, Young Arthur (not Sulzberger) pulls the plug on Delicious! magazine. In one of the book's less plausible developments, Billie is kept on alone in the deserted mansion to continue fielding complaints from readers, honoring the Delicious! money-back guarantee on recipes that don't work as promised. This confection might play better with Young Adult readers. Its best parts involve a series of cunningly hidden letters written to the illustrious chef James Beard during World War II by a plucky adolescent named Lulu Swan, who is suffering homefront hardships in Akron, Ohio. Reichl whips up plenty of righteous indignation as Lulu (and Billie, 70 years later) discover upsetting injustices, including wartime prejudice against Italian-Americans, women losing their factory jobs after the men return home from battle, and the "Lavender Scare" against homosexuals in the 1950s that cost Reichl's version of Beard his fictional job at Delicious! magazine. Reichl's book, in part a paean to the foodie heaven of downtown Manhattan, is filled with a cast of cookie cutter eccentrics who nudge her ugly duckling heroine toward becoming the swan she's meant to be (like Lulu Swan, of course). These include an older gay art director whose affected, pompous, contraction-free speech makes us contract in disbelief. ("Do not be delicate." "Have you the key?" "Loneliness is pernicious ... We will commence ...dining together on a regular basis.") Sal Fontanari, owner of an iconic Italian grocery where Billie helps out on weekends, is straight from central casting. Some descriptions read like spoofs of Reichl's scene-setting restaurant reviews: "Her boots were made of the softest leather, the kind that melts beneath a single drop of snow." Is this a good thing? Autumn Parmesan is distinguished from spring cheese with raptures more often associated with wine-tasting: "When I put the cheese in my mouth it was richer, and if I let it linger on my tongue I could taste the lush fields of late summer, just as the light begins to die." As for Billie's inamorato, "His breath smelled like fruit, like oranges and cherries" — despite his steady diet of garlicky cured meats from Fontanari's. If this doesn't make you gag, the love scenes surely will: "He kissed me roughly, hungrily, and I could feel my lips begin to swell as my body arched toward him." Delicious!, as predictably sweet as packaged cakes, ends on a high note — with Billie's much-hyped gingerbread recipe, which calls for lots of fresh ginger and orange juice and grinding your own spices, including cinnamon. The recipe is a reminder about where Reichl's real talents lie.